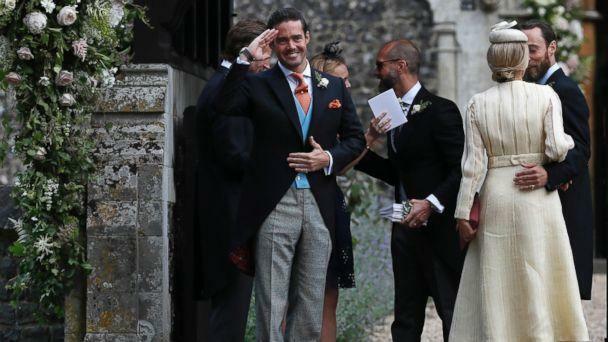 Pippa Middleton's wedding today was attended by high-profile guests including her older sister, Princess Kate. 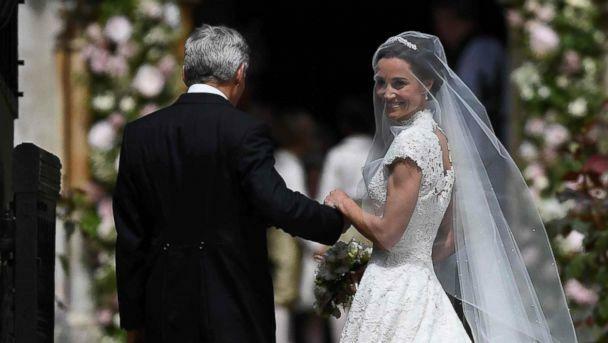 Middleton, 33, donned a white gown designed by Giles Deacon at her wedding to James Matthews, a 41-year-old financier, at St. Mark's Church in Englefield, Berkshire. 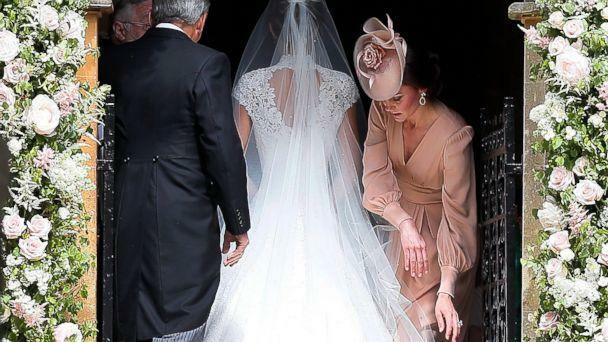 Middleton's bespoke veil was designed by milliner Stephen Jones and featured tulle and embroidered pearls. The bride wore a tiara handmade by Robinson Pelham and donned ivory satin Manolo Blahnik pumps. She carried a bouquet of peony, sweet pea, astilbe, freesia, waxflower, green bell and alchemilla mollis. Kate, 35, dressed in pink, was photographed arranging the train of Middleton's gown as she entered the church. 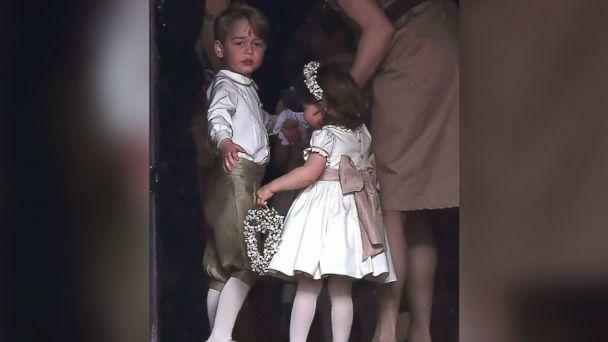 Middleton’s nephew, Prince George, 3, and niece, Princess Charlotte, 2, joined the wedding celebration as a page boy and bridesmaid, respectively. 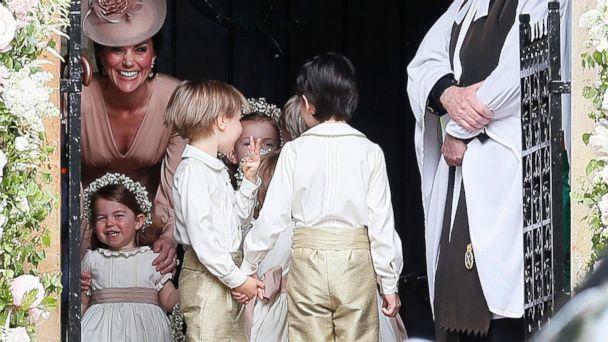 George and Charlotte were part of a group of eight in the bridal party, all wearing custom-made outfits designed by Pepa & Co.
Other members of the royal family in attendance included Middleton’s brother-in-law, Prince William, and his brother, Prince Harry, and their cousin, Princess Eugenie. 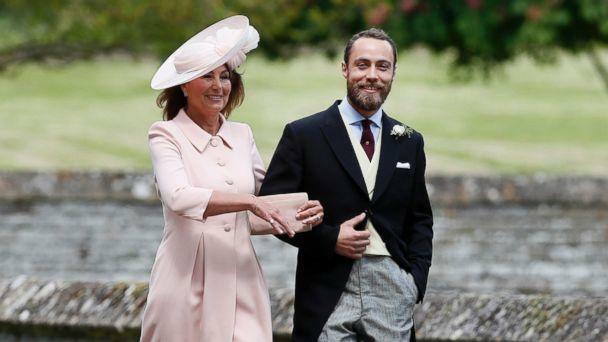 Middleton's parents, Carole and Michael Middleton, her brother, James Middleton, and Matthews' family, including his parents, David and Jane Matthews, and his reality TV star brother, Spencer Matthews, were also in attendance. St. Mark’s Church is located just six miles from Bucklebury, where Middleton was raised. 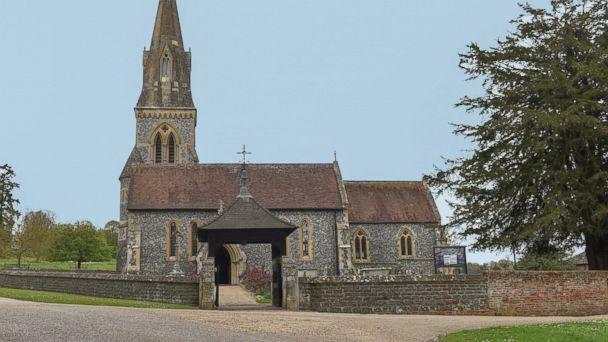 The church is located on the private Englefield estate, the home of Richard Benyon, one of Britain’s wealthiest members of Parliament with an estimated net worth of $150 million. Approximately 100 guests were invited to the more intimate and exclusive church service. 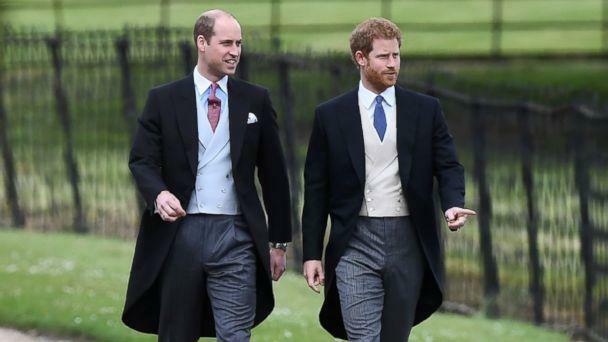 The guests were a who's who of London society, including Donna Air, James Middleton's girlfriend, and Charlotte's godparents, Tom van Straubenzee, James Meade and Sophie Carter. Tennis star Roger Federer and his wife, Mirka, were also spotted arriving at St. Mark's. Guests walked to the church on a pathway across a field where members of the media and local residents had gathered. 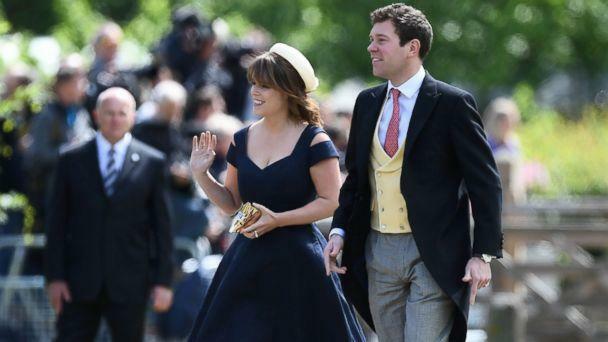 The newlyweds have invited around 300 guests to a private evening reception at the Bucklebury home of Middleton's parents. The Middletons' $8 million mansion, dubbed "Bucklebury Manor," boasts seven bedrooms and sits on 18 acres of property with stunning gardens, fish ponds, a tennis court and pool. A large glass tent structure, estimated to cost more than $100,000, was erected on the property for the reception. 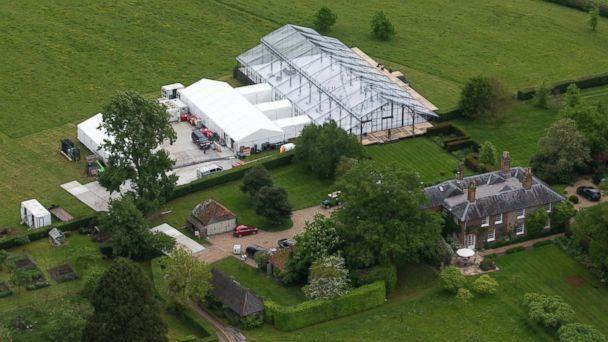 A number of luxury vehicles, including Bentleys and Range Rovers, have been offloaded near the church in Englefield and the Middletons' home to ferry guests to and from the wedding and reception. Middleton and Matthews hired international event planning company Fait Accompli to oversee the logistics of their celebration. The reception will be catered by Table Talk, a high-end firm where Middleton worked before her sister, Kate, married William in 2011. The tight security that surrounded today's church service is expected to continue at the wedding reception. Workers reportedly had to sign confidentiality agreements, and camera phones will be reportedly removed before people enter the reception. Matthews is an investor and hedge fund millionaire who owns Eden Rock Capital Management, which he named after his parents' famous, five-star St. Barts resort. Matthews and Middleton dated briefly in 2012 and rekindled their relationship in 2015. The couple, who share a $25 million London townhouse, publicly confirmed their relationship with an appearance at Wimbledon in July 2016. Matthews proposed to Middleton at England's Lake District that same month. Middleton's multicarat engagement ring is an Asscher-cut, hexagonal-shaped diamond set in platinum surrounded by multiple smaller diamonds.